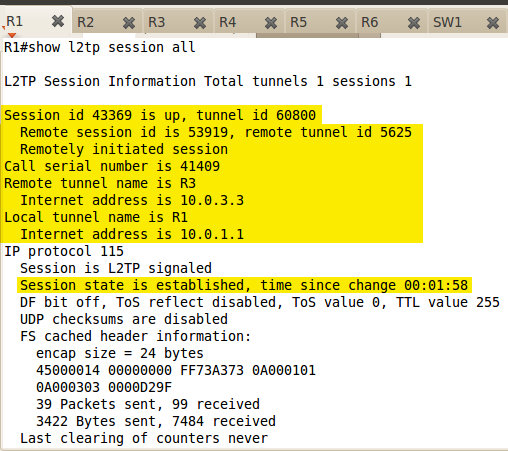 Based on the previous lab configuration, assume there is no MPLS between PE1 and PE2 (already removed in Lab 184). Remove L2TPv3 configuration from PE1 and PE2. Configure PE1 and PE2 to provide layer 2 VPN service between CE3 and CE4. If the task requires this, you can create required static routes and additional interfaces. Use AToM encapsulation to accomplish the task. Yet another "interesting" hack here. Don't you miss the time when things were simpler and there was only one way of getting it done? In previous lab we have removed LDP protocol. For this solution to work, LDP must be implemented (it is used on Tunnel interfaces). If your configuration contains solution from the previous lab (Lab 179), please remove that solution before you proceed. You are allowed to use one static route on in R1 and R3. If you already know how to solve the problem based on the above data, skip the tasks below and go ahead with your solution. In BB1 and SW3 remove configuration created in lab 179 before proceeding with the tasks below. In BB1 create a loopback interface with IP address of 111.111.111.1/24. This will represent Internet address for a connectivity test. 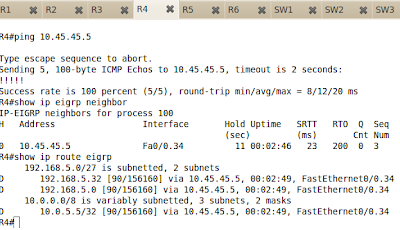 Technically, vrf INTERNET does not have to be configured on R1 and R3 (PEs), since we will use static routing to the central site (10.0.8.8) in task 6. Here vrfs are added only for consistency sakes. 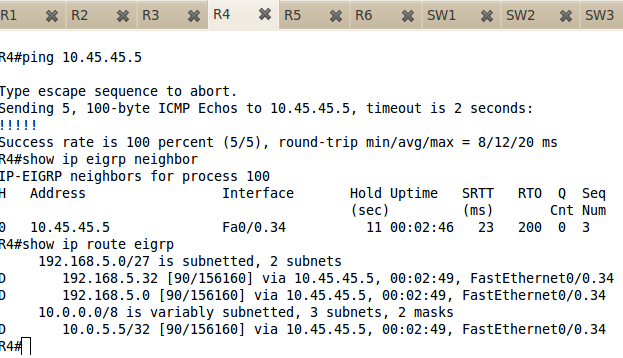 Configure BGP peering between SW3 (AS: 1) and BB1 (AS: 254). BB1 should advertise default route towards SW3. This default route should be learned as INTERNET VPN prefix (VRF INTERNET). These subnets should be advertised with their /24 network mask length towards the Internet (BB1 should learn them). Configure SW3 so that it advertises the default route towards SW2. Test the connectivity from SW2 loopback 10 interface (8.8.8.8) towards 111.111.111.1. 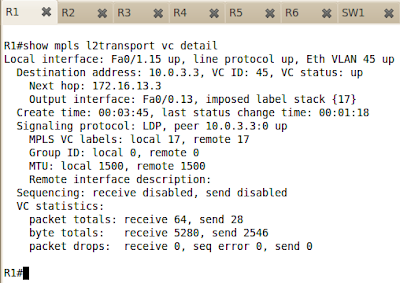 Configure R1 and R3 (PE routers) such that they distribute the default route towards R4 and R5 respectively. Ensure that PE routers point to 10.0.8.8 (SW2) as the central gateway towards to Internet. You are allowed to create one static route on each PE to accomplish the goal. Consider your BB1 as the router connected to the Internet. SW3 should have its VLAN 111 interface placed in the global routing table. The below subnets will simulate Internet prefixes. Allow SW2's subnet 10.0.8.0/24 access to the Internet prefixes (132.1.x.x). This access should be done via SW3's global routing table. You are allowed to use one static route in SW3 to accomplish this. In SW3 enable loopback1 interface with the address: 10.0.99.9/24. Configure the following vrf in SW3 and assign loopback1 into it. 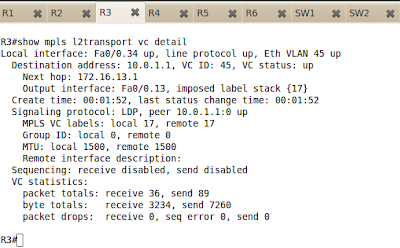 Ensure that two (and no other) subnets: 192.168.6.8/29 (R6's Loopback2) and 10.0.8.8/24 (SW2's loopback0) can reach VoIP gateway address. VoIP gateway expects to communicate with the prefixes advertised as route-target 1:501. Restore the Lab 175 configuration after you have completed Lab 176 tasks.